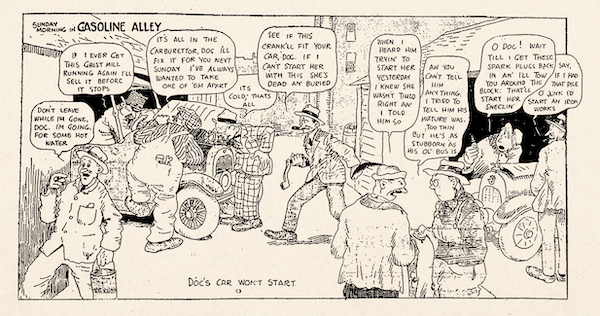 eToday Is The 100th Anniversary Of An Outside Contender For Greatest Comic Ever: Gasoline Alley! Here's everything I think of when I think of Gasoline Alley, which first appeared in newspaper 100 years ago today. Thanks to Peter Maresca for sending along the scan of the first strip. 1. It's an amazing comic from multiple angles. At it's best it's a day to day treatise of life as lived by a 20th century father and son, as touching and subtle a relationship as ever played across the comics page. It was formally audacious, particular the use of color and the in several staged single illustration across which panel progression takes place. It's an incredibly well-crafted strip -- don't sleep on the dialogue, which is layered and assured, particularly noticeable in the pre-Skeezix strips. I think it's underappreciated for its original conception of a depiction of life as changed by the automobile, and the various nuances and gradations of that sub-culture. Gasoline Alley is one of the great strips where you're carried along by the appealing nature of the characters, and the growing emotional investment that comes with that. This is one of the reasons why older work matters, and it's a notion presented with greater clarity in comics than any other medium. 2. As a legacy strip it's always had good to excellent cartoonists working on it, even though I prefer the King work by miles. 3. When I was a kid, I knew it as the strip where the characters aged along with the feature. I think this added a great deal of pathos to the initial strips, and some unintentional humor to the later offerings. That's still a super-interesting concept, making GA maybe the first strip where its appeal was mistakenly assigned to a boiled-down concept rather than the quality of the work itself. 4. The collections of the early work by Drawn + Quarterly and Sunday Press Books are of an extremely high standard and were the reason for the work's reappraisal. I still have nightmares about the number of camping photos in one of the volumes, but nearly every volume are among the best single publications of any type any years they've come out, and they've done a great job driving attention and admiration to the work itself. They are among my more cherished comics reading experiences. 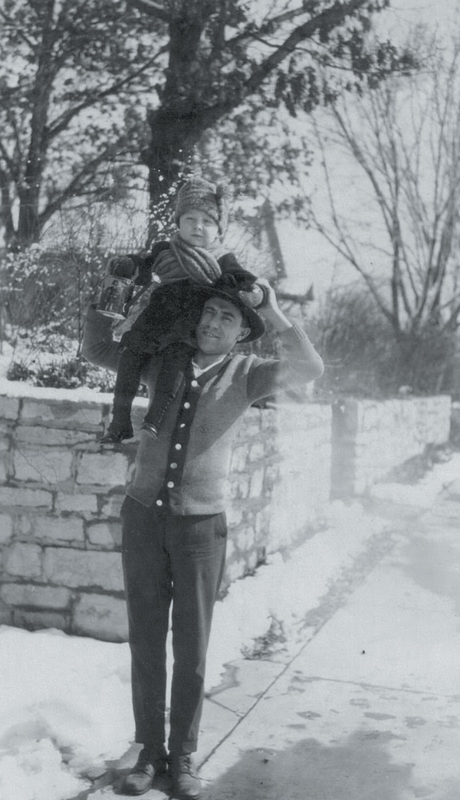 As an added bonus, Chris Oliveros sent along the photo below of Frank King and his son Robert from about a year before the strip began to publish. It's a portrait of father and son not unfamiliar to Gasoline Alley readers. Gasoline Alley is one of our best strips to read in order to connect with its author, a rewarding way to engage with that kind of work. If you have the ability to buy one of these volumes or get to a library and borrow, let me suggest that might be a fine way to fill some hours during holiday-season downtime. It might become a lifetime experience.